1965, J PL Tech Memo 32-316, 1965. 4. Bauer, H. F., Theory of the Fluid Oscillations in a Circular Cylindrical Ring Tank Partially Filled with Uquid, NASA TN D-557, 1960. Influence Upon Stability, NASA TR R-187, 1964. 6. Beard, R. M., J. E. Kronenfeld, and E. Areu, Small Astronomy Satellite-2 (SAS-2), Dynamic Attitude Determination System (DYNAD) Mathematical Models and Results from Processing, Comp. Sc. Corp., 3000-33900-01TR, Dec. 1974. 7. Beletskii, V. V., Motion of an Artifical Satellite About its Center of Mass, NASA TT F-429, 1966. 8. Bourke, Roger D., Stephen R. McReynolds, and Kathryn L. Thuleen, "Trans-lational Forces on Mariner V from the Attitude Control System," J. Spacecraft, Vol. 6, p. 1063-1066, 1969. 9. Butcher, J. C., "On the Attainable Order of Runge-Kutta Methods," Math. Comp. Vol. 19, p. 408-417, 1965. 10. Carnahan, Brice, H. A. Luther, and James O. Wilkes, Applied Numerical Methods, New York: John Wiley & Sons, Inc., 1969. 11. Chen, L. C. and J. J. McEnnan, SIRIO Attitude Analysis Postlaunch Report, Comp. Sc. Corp., CSC/TM-77/6264, Oct. 1977. System for Cable-Connected Artificial-g Space Station," J. Spacecraft, Vol. 11, p. 165-172, 1974. 14. Chubb, W. B., H. F. Kennel, C. C. Rupp, and S. M. Seltzer, "Flight Performance of Skylab Attitude and Pointing Control System," J. Spacecraft, Vol. 12, p. 220-227, 1975. 15. Cloutier, Gerald J., "Elevation Stepping of Gimballed Devices on Rotor-stablized Spacecraft," J. Spacecraft, Vol. 12, p. 511-512. 1975. 16. 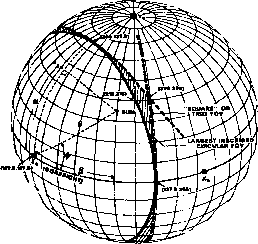 Davidson, John R. and Robert L. Armstrong, "Effect of Crew Motion on Spacecraft Orientation," AIAA J., Vol. 9, p. 232-238, 1971. 17. Dobrotin, B., E. A. Laumann, and D. Prelewicz, Mariner Limit Cycles and Self-Disturbance Torques, AIAA Paper No. 69-844, AIAA Guidance, Control, and Flight Mechanics Conference, Aug. 1969.